Nestled among mature palm trees, lush tropical foliage and manicured gardens, Sandalo is the quintessential Caribbean retreat; the lifestyle offered at Sandalo is simply second to none. Set on the pristine Gibbs Beach, one of the finest beachfront communities on the West Coast of Barbados, the villa's architecture masterfully blends both indoor and outdoor living spaces to create an idyllic holiday home. Featuring five lavishly appointed bedrooms, ample outdoor living space and luxurious finishes throughout; the 6 000 square foot villa is ideal for a large family or group, as well as the couple looking for a spacious home for holiday entertaining or relaxing. 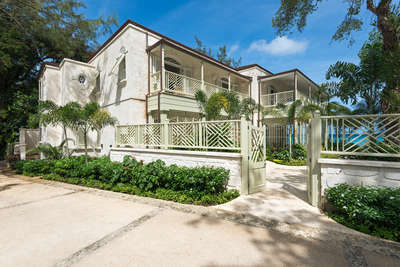 With refurbishments overseen by renowned Barbadian architect Ian Morrison, Sandalo has been tastefully decorated with superlative finishes throughout, including expert coral rendering, marble counter tops and hand-wrought iron railings. The décor features a distinctly Caribbean theme; the main entrance showcases a stunning iridescent turquoise mosaic fountain, reminiscent of the Caribbean Sea located just steps from the villa’s landscaped gardens. An impressive collection of vibrant local art adds a sophisticated pop of colour throughout the home. The entire home is air-conditioned, however guests can also choose to enjoy the refreshing Caribbean Sea breezes. Artfully positioned to capitalize on the breathtaking ocean views, Sandalo offers two floors of interior living space. The main floor features an inviting living room; separated into two seating areas, it has an airy, comfortable feel enhanced by an abundance of natural light. A series of arches separate the living room from the terrace just beyond; decorated in a white and blue motif, it features comfortable seating and an outdoor dining area overlooking the villa's gardens and pool. Adjacent to the living room is a small bar area and guest bathroom. The gourmet kitchen has custom cabinetry by Joshua Jones of the United Kingdom, wide marble counter tops, stainless steel high-end appliances, walk-in fridge, cold storage, pantry and wine fridge. A large dining table, suitable for up to 10 guests, provides the perfect setting for intimate family breakfasts or impromptu late night refreshments. The media room, equipped with state-of-the-art plasma TV, electronic game consoles and surround sound, is fully stocked with a selection of books and DVD's. Decorated with sumptuous leather chairs and English Cricket memorabilia to create a cozy escape for watching movies, reading a book or simply relaxing when the mood strikes. There is a Sony PC for internet access, and wireless internet access is available throughout the property to connect through your own devices. Four bedrooms are located in the main house on the upper level. The master suite has a super king size bed; two of the guest suites have king size beds and the fourth bedroom is a twin room. There is a fifth bedroom suite in the separate guest cottage which has a private garden patio. All five bedrooms are decorated with plush linens, charming wooden furniture and vibrant local artwork to create inviting retreats, and TV's. They feature luxurious marble tiled en suite bathrooms with rain showers and four of them have double sinks. All bedrooms have spacious walk-in closets and wardrobe space. The master bedroom and two double guest suites in the main house all open out onto private balconies with wonderful views of the pool and sparkling Caribbean Sea. Drawing from their own experiences and preferences, the owners have carefully selected and trained the villa’s staff to provide exceptional service, including five-star dining prepared in Sandalo's own gourmet kitchen by the villa’s chef. From home-baked breakfast pastries served with fresh local fruits and catered picnic beach lunches to sunset cocktails and canapés or multi-course dinners with a sophisticated Caribbean twist, each meal is masterfully prepared to guestsʼ specifications. In addition to the villa’s chef, a butler, housekeeper, maid and gardener complete the Sandalo team. Every morning, the Sandalo staff will place comfortable beach loungers, umbrellas, towels and ice boxes on the beach for guests' use. Our butler will serve cocktails, iced drinks, ice cream and snacks whenever requested throughout the day, leaving you to totally relax and enjoy the Caribbean sunshine. Additional services can be provided on request, including nannies, babysitters or additional catering and bar staff. Guests are assured privacy by a sophisticated security system and on-site security guard. While Sandalo shines as one of the island’s most impressive beachfront estates, its surroundings only enhance its appeal as a holiday home. With no commercial or large developments in the area, Gibbs Bay has long attracted preeminent residents who value the peace and quiet afforded them by its exclusive location. Enjoy walks along the stretch of white coral sand, gently lapped by the crystal blue waters of the Caribbean Sea, or for a change of pace, enjoy full water sports facilities and a friendly beach bar on Mullins Beach, just a five minute walk from Sandalo. Speightstown, the island’s quiet, undisturbed seaside town with an array of restaurants, shops and conveniences, is just a few minutesʼ drive north from Sandalo. To the south is the busier Holetown area, with world-class shopping, dining and nightclubs, as well as world-renowned golf courses at Sandy Lane and Royal Westmoreland, and tennis at Sugar Hill. Beach gate leading to white sandy beach. Pool area equipped with barbecue, ice maker and fridge. Media room equipped with 50" HDTV, Blu ray player, BOSE sound system, Nintendo Wii and PlayStation gaming consoles. Housekeeping (2) services (six days per week). Chef services (seven days per week). Butler services (seven days per week). Security guard (six days per week).